Monica Torres, “This is what pregnancy in the workplace looks like,” Ladders, Nov. 29, 2018. Ladders talked to photographers and subjects involved in the “Showing: Pregnancy in the Workplace” project about what these photos can tell us about being pregnant and working. “Работающим беременным женщинам посвятили фотовыставку,” NEN, Nov. 7, 2018. The non-profit media organization Working Assumptions implemented a photo project dedicated to working pregnant women in the United States. 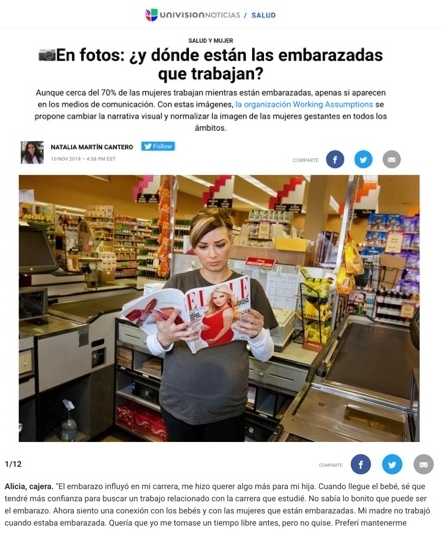 Aunque cerca del 70% de las mujeres trabajan mientras están embarazadas, apenas si aparecen en los medios de comunicación. Con estas imágenes, la organización Working Assumptions se propone cambiar la narrativa visual y normalizar la imagen de las mujeres gestantes en todos los ámbitos. Julia Belluz, “Photos: how millions of moms work through pregnancy,” Vox, Oct. 31, 2018. Forty years ago today, on October 31, it became illegal to discriminate against pregnant women at work in the United States. 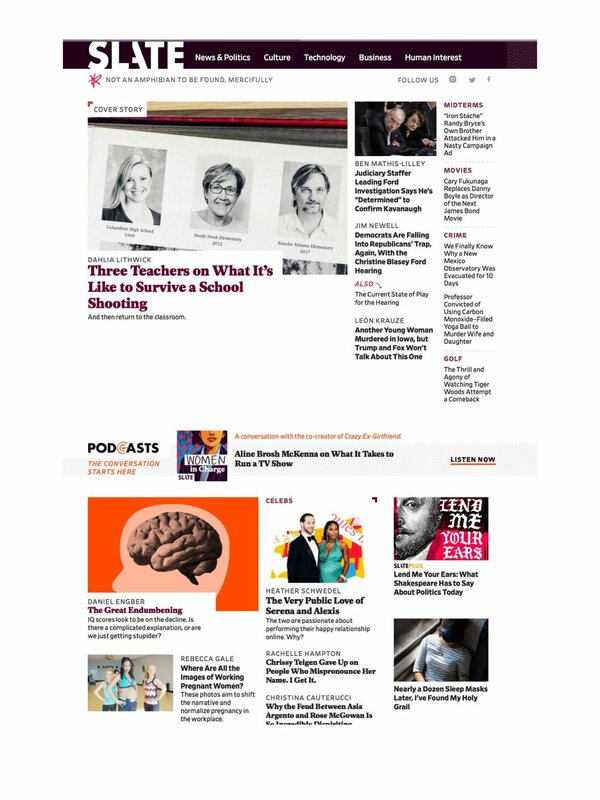 Fortune - Broadsheet, “PHOTOS: HOW MILLIONS OF MOMS WORK THROUGH PREGNANCY,” VOX, Nov. 1, 2018. Working moms. Wednesday was the 40th anniversary of the Pregnancy Discrimination Act, the law protecting pregnant women in the workplace. To honor that milestone, here’s an incredible photo series of pregnant women at work—in hospitals, in grocery stores, in the outdoors, and in Congress. Apple News, “PHOTOS: HOW MILLIONS OF MOMS WORK THROUGH PREGNANCY,” VOX, OCT. 31, 2018. Apple News links to Vox article. “40 Years After the Pregnancy Discrimination Act, Working Assumptions Showcases Photographs of Pregnant Workers,” WORKING ASSUMPTIONS. Oct. 24, 2018. Rebecca Gale, “Where Are All the Images of Working Pregnant Women?,” Slate, Sept. 20, 2018. 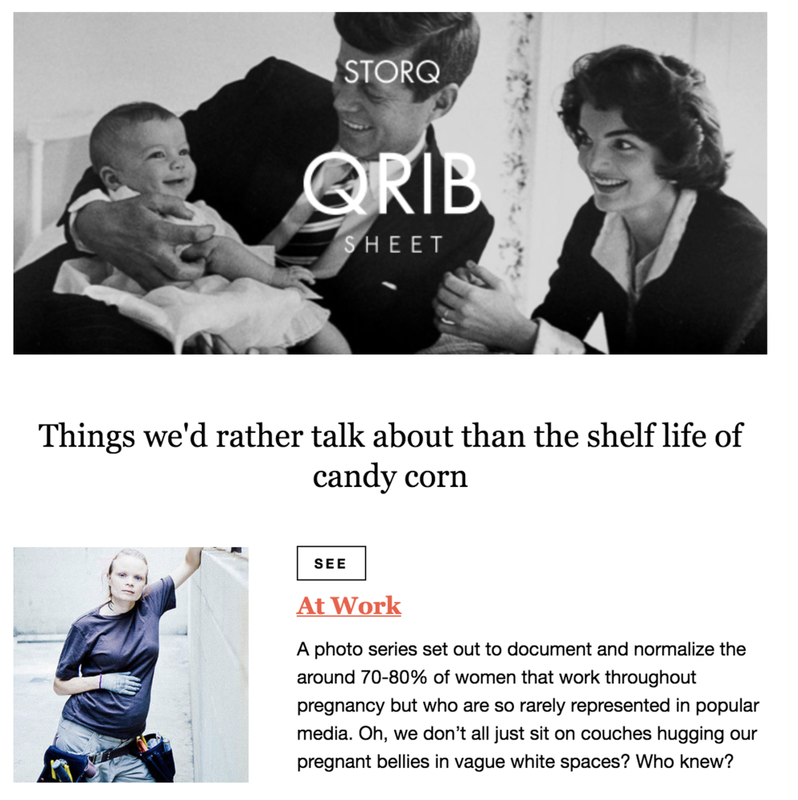 Qrib sheet, storq Newsletter, “WHERE ARE ALL THE IMAGES OF WORKING PREGNANT WOMEN?,” SLATE, SEPT. 20, 2018. STORQ’s QRIB SHEET features Slate article in its newsletter. “Working Assumptions Foundation Announces Appointment of Susan Krane as Executive Director,” WorkinG Assumptions. Nov. 15, 2017. 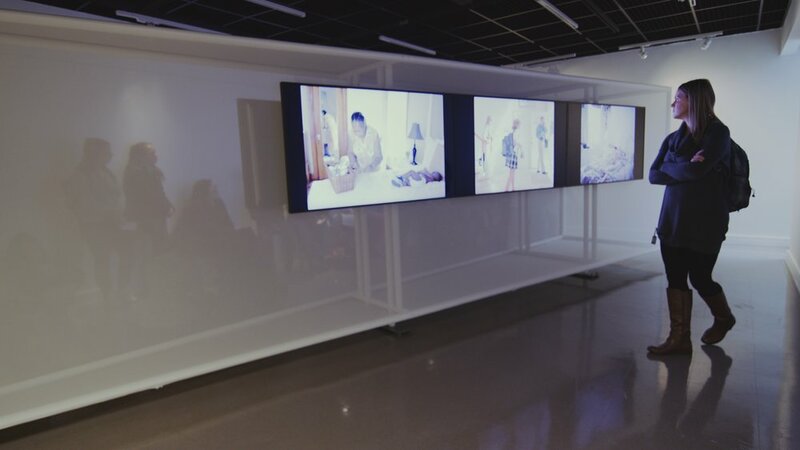 “Digital Photography Installation Captures the State of Work and Family Life in Framingham State University Premiere,” Working Assumptions, Nov. 8, 2017. The MetroWest Daily News, Nov. 8, 2018. Framingham State University, Massachusetts. 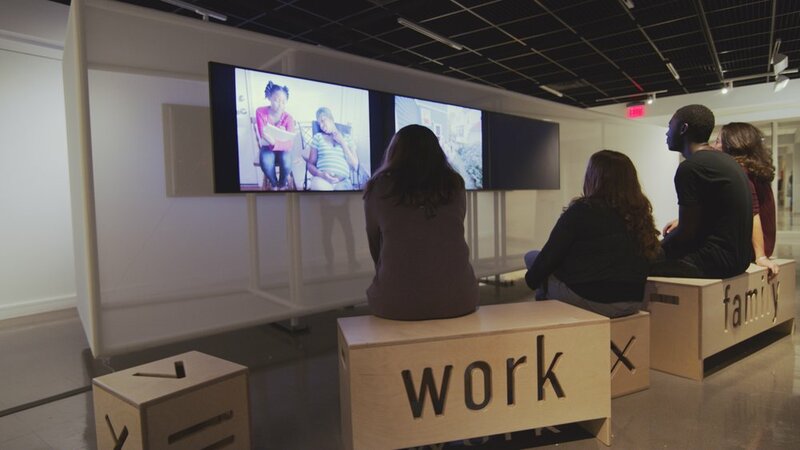 “Photography Exhibit on Work and Family Diversity Makes National Debut at Framingham State University this Month.” Nov. 1, 2017, Accessed May 7, 2018. Trudy Wilner Stack, “Showing (work x family) in Preview: A Project in the Making,” Exposure, Journal of the Society for Photographic Education, Spring 2017. 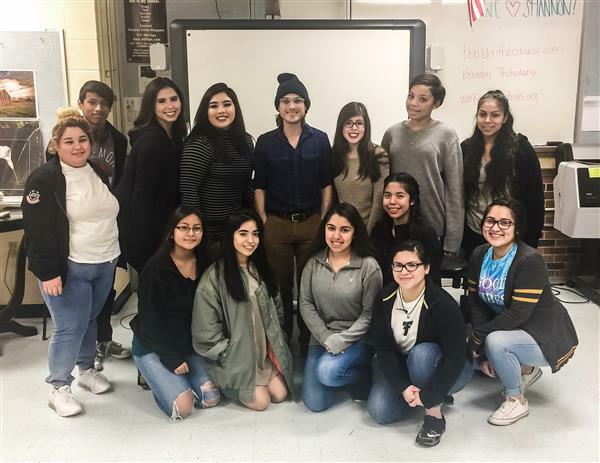 “Photography Students Enter Nationwide Photography Project,” Trimble Tech High School News, Fort Worth, Jan. 19, 2017. Caitlin Cater, “Showing: Images of Work and Family,” United States Department of Labor Blog, Oct. 24, 2016.